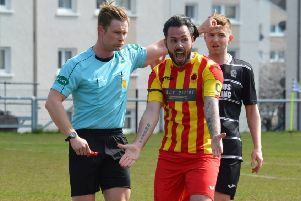 A last-gasp Glenafton winner dealt a cruel blow to relegation-threatened Kirkintilloch Rob Roy’s survival hopes on Saturday. Despite being the better side for most of the game Stewart Maxwell’s side came away from Ayrshire empty-handed. The defeat leaves them third bottom, three points from safety but with a game in hand at home to second bottom Petershill tonight (Wednesday). The first chance of the match fell to the Rabs but Willie Sawyers’ shot lacked power and failed to trouble Glens keeper Brian McGarrity. The home side replied with Mick McCann’s curling shot flashing narrowly past Craig Gordon’s left hand post and then the keeper was called into action to save from Ally Park’s snap shot. In the 15th minute, from a Sawyers’ lay off, Alex Cassells shot wide from inside the box as the Roy pressed for the opener. With the strong wind advantage, Glens came close two minutes later when Alan Cairns’ 20-yard free kick was headed over the bar by Ryan McChesney. Minutes later Rabs’ keeper Gordon did well to make a goalline save from Davie Winters. Both sides had to battle the conditions as the swirling wind and hard pitch made it difficult to produce fluent football. But the Roy were resolute and dangerous on the counter attack. 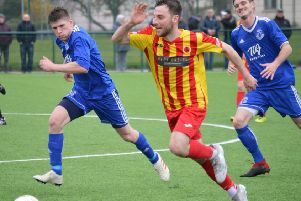 On the half hour mark Martin McBride was brought down 25 yards from goal and from the resulting free-kick McBride’s shot crashed against the Glens crossbar with McGarrity well beaten. Cairns then had a chance to put the hosts ahead but hammered the ball well over from distance. Just before the break, Joe Slattery released Cassells on goal but his chipped effort proved no problem for McGarrity. After the break, with the wind, Rabs took the game to Glenafton with Sawyers and Connor Hughes both having decent attempts. In a break upfield, ex Rab Findlay Frye sent a shot well over the bar for the Glens. In the 62nd minute Sawyers’ lay off found Cassells but his effort was off target. The Roy were now making the better chances. Slattery’s cross to Sawyers was well cleared by the Glen’s defence for a corner and another cross from Slattery caused problems for McGarrity before being scrambled clear. McBride’s shot from distance went narrowly over and McGarrity did well to smother Slattery’s low shot as the visitors went all out for the win. Hughes and Gavin Mackie then had shots blocked by desperate defending before McBride hammered a rebound over from the edge of the box. The impressive McBride then saw his next attempt on goal taken low by McGarrity as the Glens held on. However as the match entered stoppage time the Roy were hit with a sickener when Dan Orsi’s cross from the right fell kindly for Parks and his scuffed shot bounced in at the far post to give Glenafton the lead. There was little time left for Rob Roy to recover and the Glens came away with an undeserved win against a Rabs side that had no failures.